Dough – You Asked It! Always wash your hands after handling any type of raw dough. Bake items made with raw dough or batter before eating them. Follow the recipe or instructions on the package. 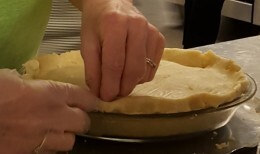 Wash your hands with water and soap after handling dough or batter. Restaurants should not give customers raw dough to play with or eat.